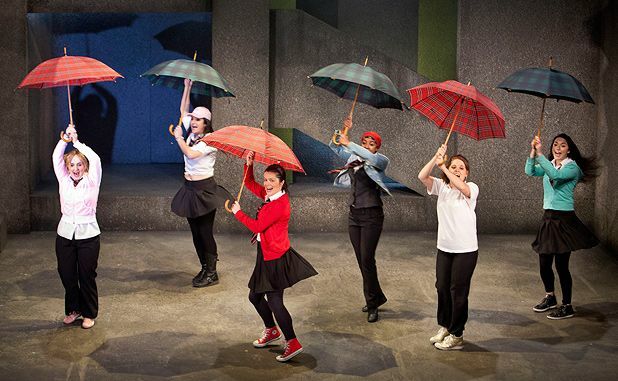 There’s a scene in this lively new National Theatre of Scotland-produced musical in which the youthful heroines sing of their deep affection for Glasgow, for all its rough edges. The show itself inspires a similar reaction: there’s the odd cheesy moment but it’s impossible not to be swept along with the affecting story, the energy of the ensemble and the superb mix of musical styles. Cora Bissett’s production, based on the true-life tale of seven girls from Drumchapel High School who stood up to the brutal UK immigration system when one of their number was threatened with deportation, draws on a range of musical genres, from folk to hip hop and reggae, to create a dynamic, diverse score, co-written by Bissett with Sumati Bhardwaj, the Kielty Brothers and Patricia Panther. If there’s something a little earnest and naïve about some of the lyrics, this feels a credible complement to the refreshingly uncynical attitude of the teenage leads as they plunge headlong into the bearpit of politics and campaigning. The excellent cast, which also includes Myra McFadyen as a doughty local campaigner, more than rises to the physical demands of the action-packed show, which proves an irresistible tribute to the power of friendship and community while also packing a fearless political punch. Citizens Theatre, Glasgow, until Sat 17 Nov.
Cora Bisset, herself the original star of David Greig's Midsummer, directs her own new life-affirming, multicultural musical (also in collaboration with Greig), a vibrant celebration of Glasgow and the power of teenagers with a cause. Ages 12+.